Only $16.95 - Buy Now! Welcome to the world of MixerMaid. We work hard to deliver the best product and the best service possible. We proudly make same day order processing our standard, and confirm shipping with e-mail notification. With MixerMaid, you can always shop with confidence. Thank you for looking. 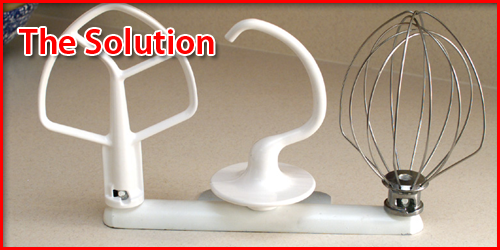 MixerMaid is a holder for the three basic KitchenAid Mixer attachments. It solves the problem of damage to KitchenAid mixer attachments due to lack of reasonable storage. 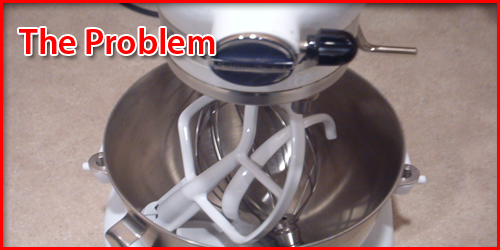 MixerMaid ends the frustration of trying to use a KitchenAid stand mixer while fumbling with the attachments. MixerMaid hangs under or inside a cabinet or pantry, using an included mounting bracket. It can be used while hanging, or can easily be removed from the bracket to sit on the countertop. As a kitchen organizer, it not only offers convenient storage, but also helps to keep the KitchenAid mixer attachments clean. Whether hanging, or on the counter, MixerMaid blends in with almost any décor, making it a great kitchen cupboard organizer, kitchen organizer, kitchen utensil holder, or kitchen pantry organizer. Purchase the MixerMaid today for only 16.95! "Holding up for me. I don't use my mixer everyday or anything like that (probably more like 2-3 times a month, sometimes more), but it's made of the more flexible plastic instead of the brittle breakable plastic, so I'm guessing it will hold up for quite some time." "Yes, it's fine and I use my mixer all the time. Does the job. Install was easy as can be." "Yes the holder is working well, and is very handy when fixing a large meal as with Thanksgiving." "I have had the pleasure of using the MixerMaid in my kitchen since 1996. I was using the original prototype till January of 2004. The MixerMaid is attractive and helps to keep my attachments organized and readily available. I love it! Great invention!" " recently purchased the MixerMaid . It was so easy to install. It keeps your attachments up and out of the way, thus keeping your drawer space available for other items." " MixerMaid is a great product! I ordered one a few weeks ago, and it is a dream! I used to store my extra two attachments right inside the bowl, until I accidentally hit the "on" switch! Now, all the attachments are conveniently stored on the countertop behind the mixer. I no longer have to worry about an unplanned fiasco! Although I have a 6- Qt. Professional Series Mixer, the item still works great! What a clever idea! Thanks for designing this much needed organizer!" " MixerMaid is the Bomb! No more searching the drawers or pantry for my attachments. Easy to install, keeps my beaters in great condition and I love the fact that I'm no longer loosing time looking for the mixer attachments. This is the best product I've ever owned...you really should purchase one." KitchenAid®. and the shape of the mixer are registered trademarks of KitchenAid®., U.S.A., used with permission. MixerMaid and the shape of the MixerMaid attachment holder are trademarks of MixerMaid Co., U.S.A.